In October we will present deconstruction and reconstruction by Seattle artist Ko Kirk Yamahira. His work is a tactile and unusual approach to minimalism, involving the removal of individual threads from the weave of the canvas. In deconstructing his paintings, he converts surface into form and presents new ways to see classically modern shapes. His work inhabits the entire space, hanging from wall and ceiling, revealing the original bones of the painting while creating softer, elegantly draping forms. 2018 has been a busy year for Ko Kirk Yamahira; earlier this year he had his first solo museum show at the Frye Museum in Seattle, curated by Amanda Donnan. He is also in a group show with Art Beasties, a Japanese art collective based in New York City, at the Tokyo Metropolitan Art Museum. 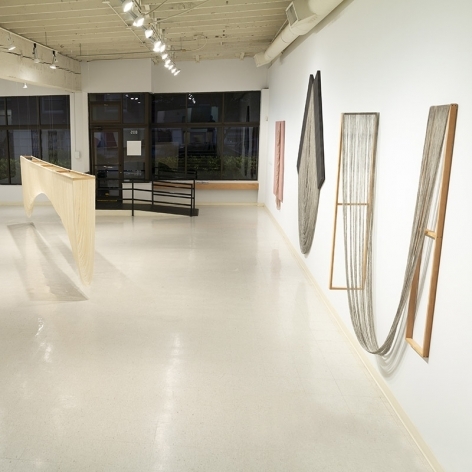 Concurrently he showed this summer at Bridge Productions in Seattle in the exhibition The Veil, a multi-media installation. Born in Los Angeles and raised in Tokyo and London, Ko Kirk Yamahira moved to Seattle from New York in 2015. He has exhibited in galleries in the United States and Japan, both individually and as a member of the artist collectives SOIL and Art Beasties. Obsessively meticulous and labor-intensive in their construction, borderline perverse in their fetishization of process and materials, Ko Kirk Yamahira’s mixed-media constructions push painting into the realm of the sculptural. The works begin as color-field paintings or silkscreens, but they don’t stay in that form for long. 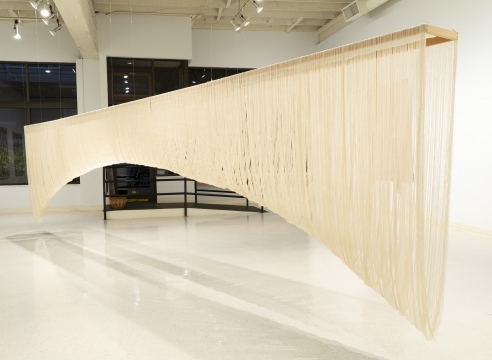 The Seattle-based artist uses an X-acto blade and scissors to unweave portions, or the entirety, of each canvas, deconstructing the picture plane into an assortment of hanging threads and fuzzy nap.